Discussion in 'iPhone and iPad Games' started by hellscaretaker, Oct 20, 2015. 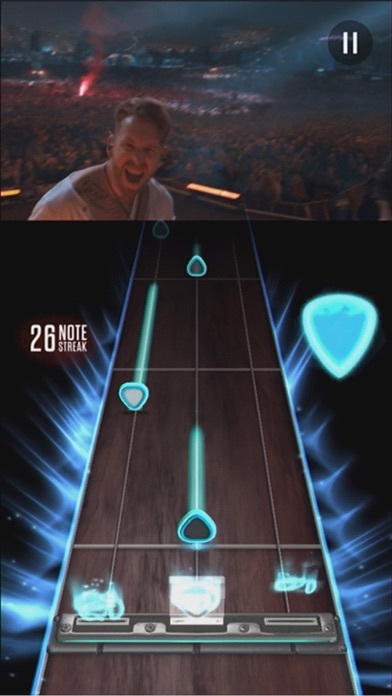 Guitar Hero® is back! 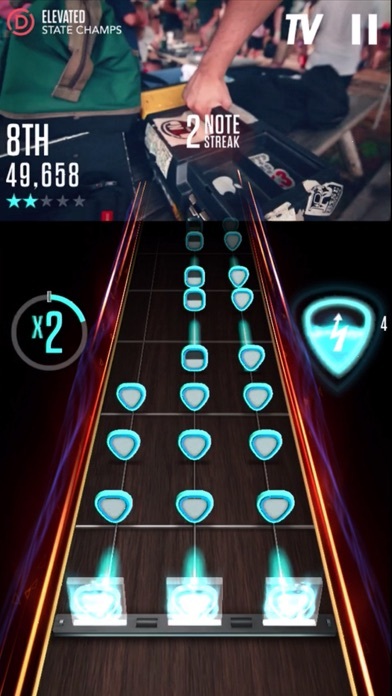 Download Guitar Hero Live (touch version) at a reduced price on your iOS device now! 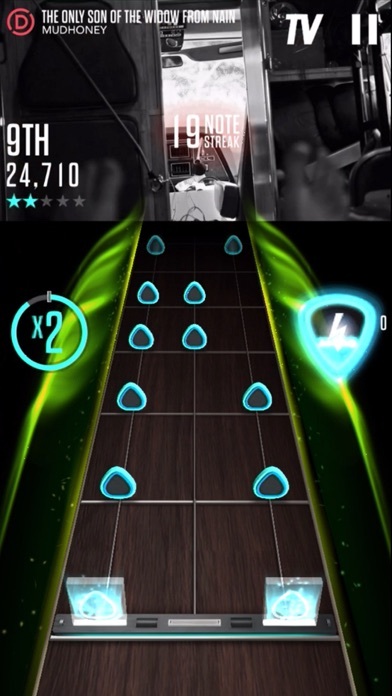 Play Guitar Hero Live on the go on your iPad, iPhone, or iPod touch or enjoy a living room experience on your TV*! Rock out to two FREE trial songs, then continue your tour by buying the GUITAR CONTROLLER BUNDLE or purchasing the DIGITAL touch only version. One game, two ways to play! 1. 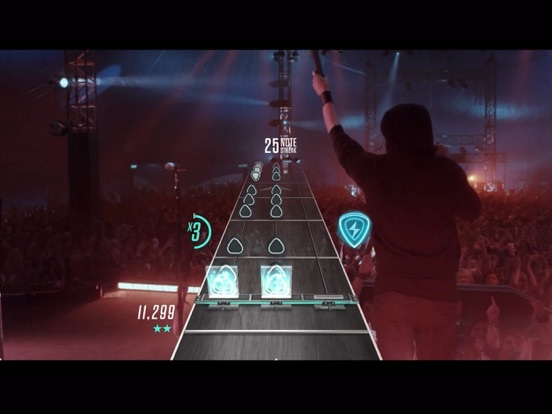 Guitar Hero Live puts you on stage rocking reactive live-action crowds. 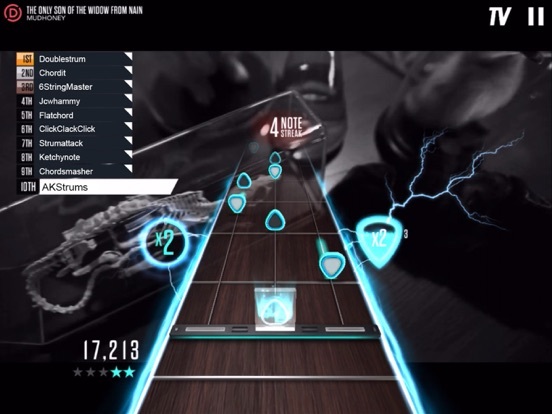 Guitar Hero Live is all about the dream of becoming a rock star. You will play with REAL band members, playing to REAL crowds, with REAL reactions to your performance. Play well and the crowd will love you! Play poorly and your fans will turn on you! 2. GHTV is the world’s first playable music video network that lets you play along to official music videos and more! Jump into one of the GHTV channels anytime, 24 hours a day, 7 days a week and get rocking! Guitar Hero Live for iPhone, iPad, and iPod Touch (available at your local or online retailer) Buy the all new iOS GUITAR CONTROLLER BUNDLE to gain access to a huge library of Guitar Hero Live and GHTV songs as well as the brand new re-invented 6 button BLE guitar controller. The new controller makes the game easier for beginners and adds new levels of challenge for expert players! 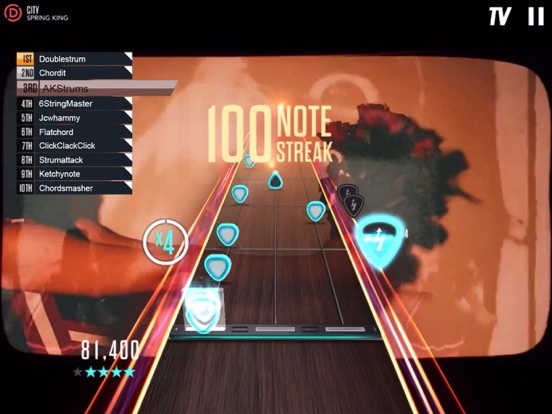 The GUITAR CONTROLLER BUNDLE and DIGITAL versions include: * Over 40 Guitar Hero Live tracks to play and master * Access to the GHTV channels featuring over 200 songs at launch * iOS touch gameplay so you can take your game on the go! Supported Devices: * iPad 4, iPad Air, iPad Air 2 * iPad mini, iPad mini 2, iPad mini 3, iPad mini 4 * iPhone 5, iPhone 5c, iPhone 5s, iPhone 6, iPhone 6 Plus, iPhone 6s, iPhone 6s Plus * iPod touch 6 Game Requirements: * Internet Connection * iOS8 or higher * Minimum storage of 3GB * BLE for Guitar Controller * A Game Center account is required to play GHTV *TV play requires Lightning Digital AV adapter and HDMI cable or Apple TV, all not included. ACTIVISION MAKES NO GUARANTEES REGARDING THE AVAILABILITY OF ONLINE PLAY OR FEATURES, INCLUDING WITHOUT LIMITATION GHTV, AND MAY MODIFY OR DISCONTINUE ONLINE SERVICES IN ITS DISCRETION WITHOUT NOTICE. © 2015 Activision Publishing, Inc. ACTIVISION, FREESTYLEGAMES, GUITAR HERO and GH are trademarks of Activision Publishing, Inc. The ESRB rating icons are registered trademarks of the Entertainment Software Association. All other trademarks and trade names are the properties of their respective owners. So do u have to buy the controller to play the game on your phone or can you play it straight up like the old mobile version. Honestly over the years I have gotten tired of this series but since it's been a while I will give it a go I guess. It's out right now in the USA App Store... downloading now and its a large file glad im on a good wifi signal, a little over 2 GB download. Oh cool. Imma check it out on the PH appstore. Crossing fingers. Crap not in the PH appstore. Would be useless to pick up from other accounts coz i wont be able to purchase from there. My god to unlock the full digital version (no controller just touch) is a $49.99 IAP. I enjoyed the trial okay but that's a bit strange a price for a scaled down touch version of the console game but I also am not sure of the console price but I am not going for that. Wow that's pretty pricey. Although i'd instabuy at that price IF it was a new Monster Hunter premium title. This is definitely worth downloading and trying it out since it's free to try at first. I don't have a special guitar, TV, etcetera but I'd prefer it that way. Will try it when I get home from work. I would have no problem shelling out the $50. Considering it's not out in Lebanon? Eh, whatever. Pretty ballsy from the deb's to price it at 50 bucks, rather than just freemium with timers and all that stuff we're used to. Curious to see how well something like this can do, but honestly don't see your average appstore user shelling out that much on a mobile game. 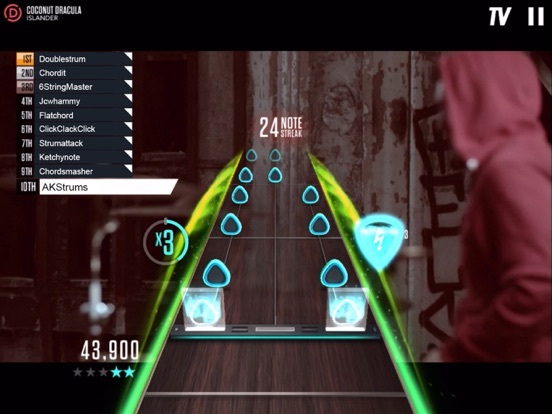 Now I wonder if the guitar you buy with the console game is iOS compatible? 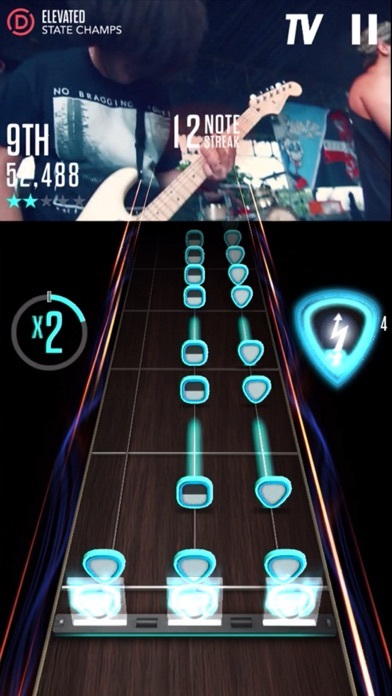 It looks like the game is 50 dollars unless you have the iOS compatible guitar.....unless that is another guitar all in itself? I woulda rather have had song packs like the old version, but maybe this is the future???. 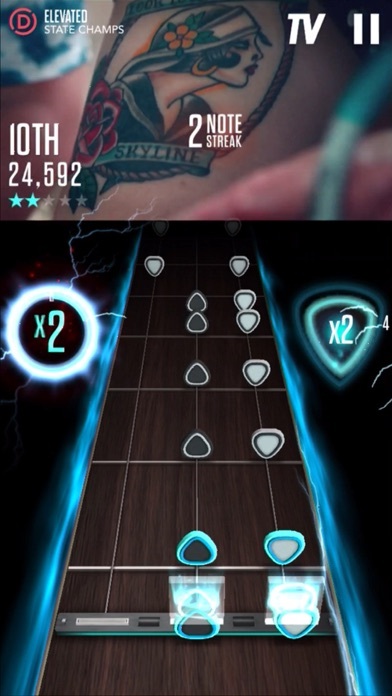 It seems like this is the same guitar but you have to buy the iOS bundle in order to get the content unlocked. There must be a code inside the box or something. I wonder if you can still play multiplayer with two controllers. Ok I edited my comments as I was being to harsh having further researched it you do get a boat load of songs and the quality is great. I'm just bored of guitar hero if someone is still a fan of these games I guess it's not too bad a deal. I think there are 2 free songs in the ios version. Yea, now that wouldn't be bad if you bought the console version and got the iOS version for free. It seems like it would be a waste to buy the console version and then pay an additional 50 bucks for pretty much the same thing, just on mobile. Maybe somebody with the console version could fill us in? I'm still on the fence on picking it up for console. 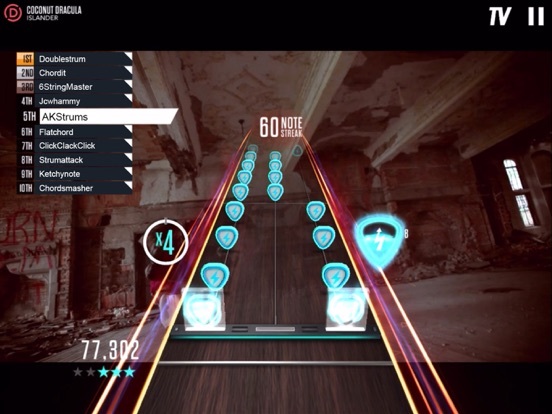 I was starting to get a little burnt out by the time Rockband 4 and Guitar Hero 5 were released. I don't think I even finished either. I still have Rocksmith and The Gig from last gen that I haven't even opened up yet. It's supposed to be a 1:1 version of the console game, hence the price point. There is no way in hell I would ever spend $50 on a mobile game after being burnt so many times. Not to mention, in the past, all of these music games have been put to rest because the license runs out. The console version is $89,99-ish vs $49,99 on iOS, so that's not too bad. But if I want to play this, it would've been on a big tv screen.